Start monitoring your trading systems! statistics of every trading system on your MT4 account. Click on the figure below to see it in action! This tool is an MT4 compatible indicator which can be attached to any chart to any timeframe. The generated report is a .html file, which is stored locally in MT4 folder. Generates charts of all (or selected) trading systems by Magic number. Total Profit, DrawDawn and WinRate. Long and short trade profits. Daily and hourly Profit/Loss overview. Possibility to add custom comments for each system! This tool is an MT4 indicator that can be attached to any MT4 chart using any timeframe. On each new candle the indicator generates a full report which is stored as a .html file in local MT4 directory. Yes a DEMO version of this indicator is available in the download link below. After a short registration you can test it with your favorite indicator on AUDUSD pair. DEMO version is limited to 3 systems only! 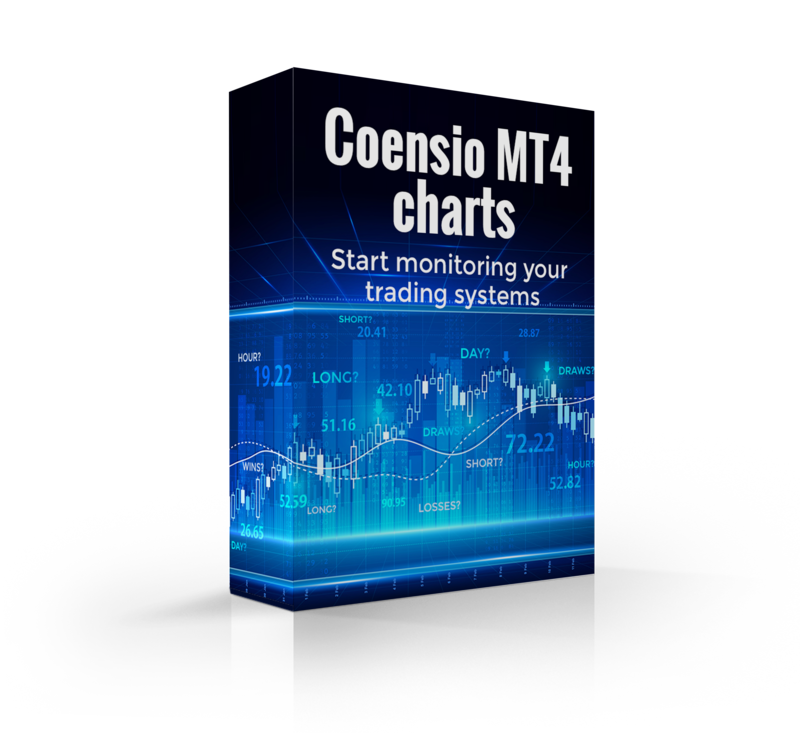 After purchasing the CoensioMt4Charts indicator, you will get your own License Key which will be linked to your personal MT4 account. This means 1 License Key is valid only on 1 MT4 account, at a time. You can always change your MT4 accounts, by sending me an email (without any additional costs). How many systems can run on one MT4 account? In theory MT4 platform supports up to 100 different charts (=100 different tradings systems). The CoensioMt4Charts indicator has been successfully tested on: Firefox, MS edge, Chrome and Safari browsers. It should work on any other moderrn browser. If you are running demo version make sure the LicenseKey indicator parameter is set to ‘DEMO’ and you have entered valid email address in EmailAddr field. After that go to your mailbox and activate this product by clicking on the provided link in the welcome email. Check your spam folder! EmailAddr: Your valid email adddress. LicenseKey: Your valid product LicenseKey. CalcFromThisDate: Start date from which statistics are generated. MagicsToCheck: Magic numbers that need to be analysed. E.g: ‘2335,33344,234,…’. Empty = All systems. FilterByLotSize: Allows to filter all trades by specific lot size. E.g. : 0.1 or 0.01. TimeHourOffset: Time offset in hours of the MT4 broker, used to synchronise time visible on charts. STEP 1: Copy the downlaoded indicator to your local indicator folder. STEP 2: Enable DLL imports. STEP 3: Enable All MT4 account history. STEP 4: Add CoensioMt4Charts indicator to any chart. STEP 5: Open generated report with your favorite web browser. CLICKBANK® is a registered trademark of Click Sales, Inc., a Delaware corporation located at 1444 S. Entertainment Ave., Suite 410 Boise, ID 83709, USA and used by permission. ClickBank’s role as retailer does not constitute an endorsement, approval or review of these products or any claim, statement or opinion used in promotion of these products.